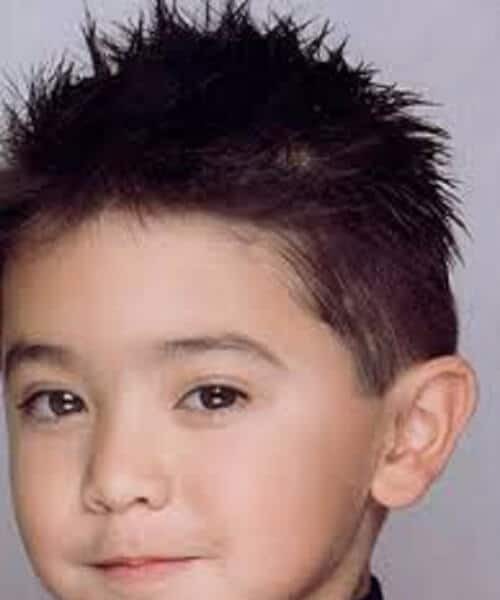 When it comes to boys haircut ideas, you know you have to choose for them, more often than not. That being said, you have two options. You can choose a classic cut – that’s been in use for decades now, or even more than that, as you’ll see below. Or you can go for a more modern option. 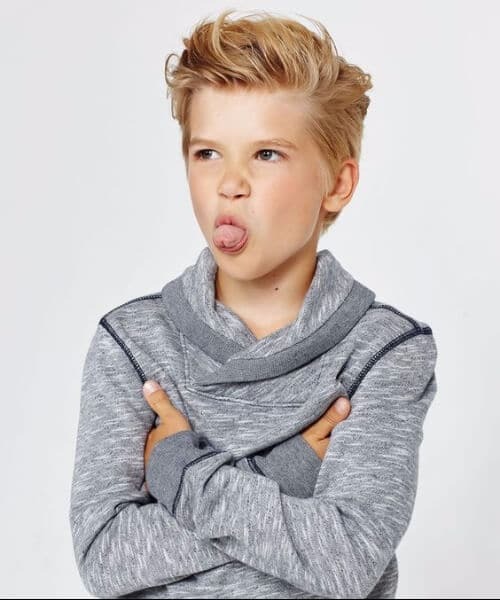 To help you out of this little conundrum, we’ve compiled a list of 45 boys haircut ideas for you to choose from. Here they are! 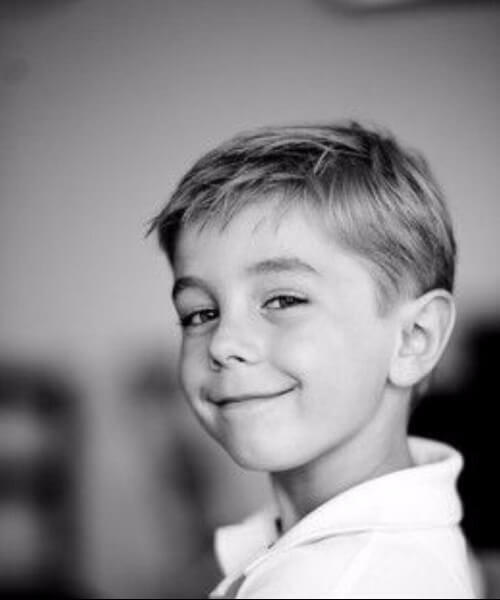 Gone are the days when a boys haircut had to be a zero or a one and when he had to be all clean and polished. 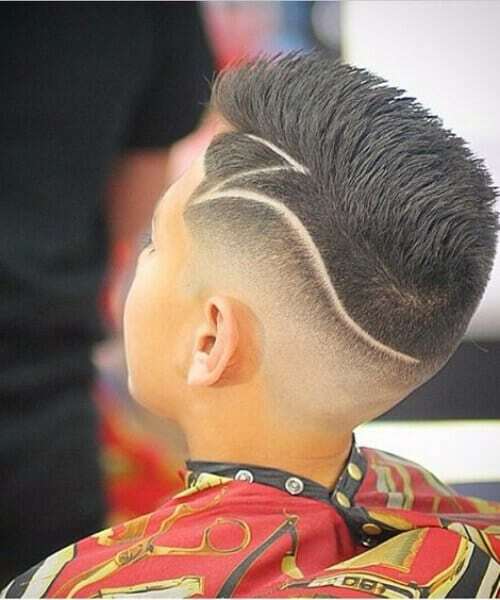 Boys are allowed to be a little more free and artistic with their hair nowadays and this cut is here to prove just that. The medium messy no part cut is one that can advantage any boy, no matter his age or the shape of his face. If he’s got the facial frame for it, why not try some bangs? However, he’s a tip from well-versed parents who’ve been through this before. Do take the time to ask the kid if he wants bangs before you give him some. It’s not a good idea to send him to school with bangs if he’s not into it. Those preteen and teen years are hard enough as it is without your mom giving you bangs. Here’s a haircut that most boys love, no matter their age. 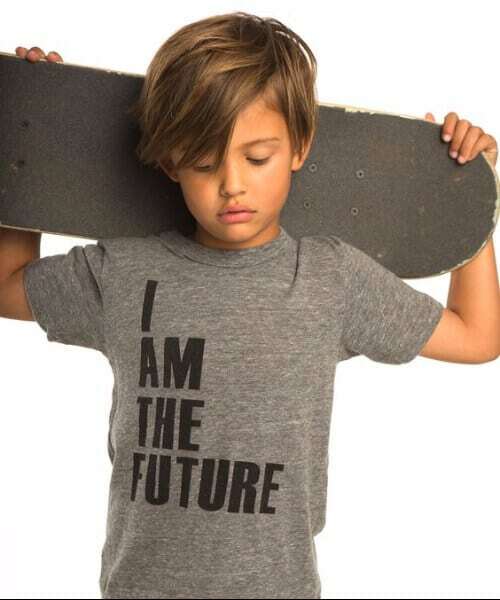 Even though it’s called the skater, seeing as it was inspired by skater boys, it doesn’t mean that your kid has to own or even use a skateboard. Or a longboard for that matter. 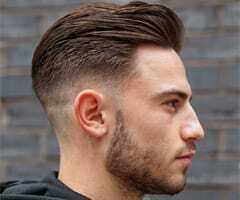 Boys who like this haircut usually like to cultivate the look. It’s all about the messy bangs and long strands of hair. 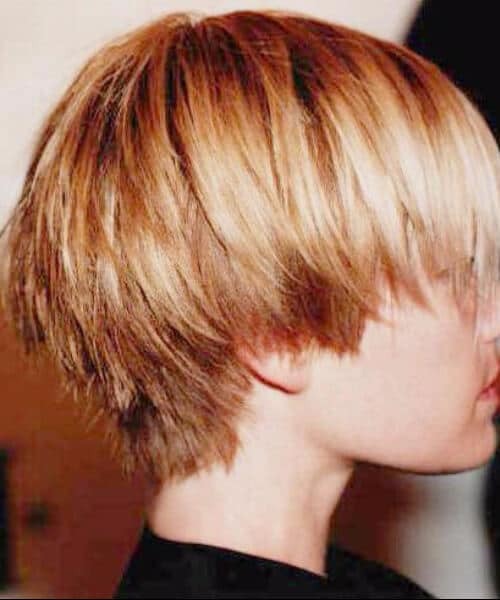 Here is one of the most modern looks and cuts you could hope for when it comes to hair. 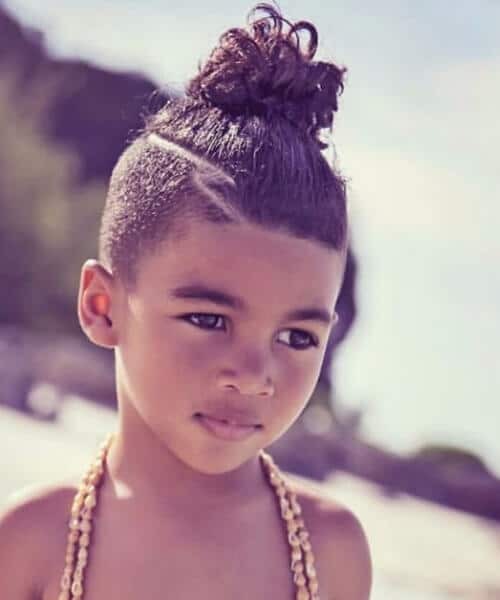 The pompadour has been all the rage in the past few years and there is no reason why your little boy shouldn’t embrace it as well. This is a flat pompadour, combed over to one side. You can also see how both sides of the head have been shaved clean, giving it a very sleek and cool look. If there’s one thing that teen boys love, that’s spikes in their hair. There’s just something about them, isn’t it? It’s like once they turn a certain age, they hear the siren song of the spikes and have to have them. Well, then, you can be a good parent and nurture your son’s love for spikes with this one of a kind haircut. It’s a messy cut, with very long spikes at the front. He’ll be needing some hair wax. 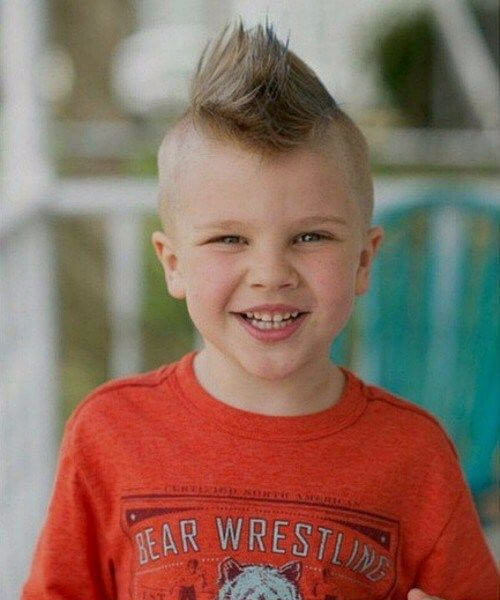 No list of boys haircuts would be complete without a fauxhawk. 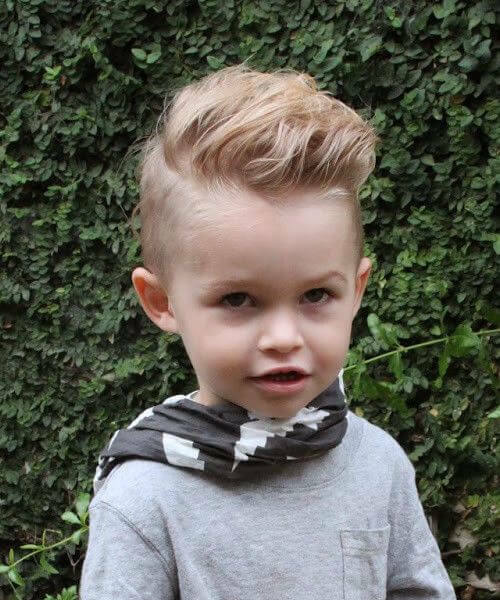 If someone ever made a top of the most adorable hairstyles for little boys, the fauxhawk would definitely come in first. Just look at this little guy! 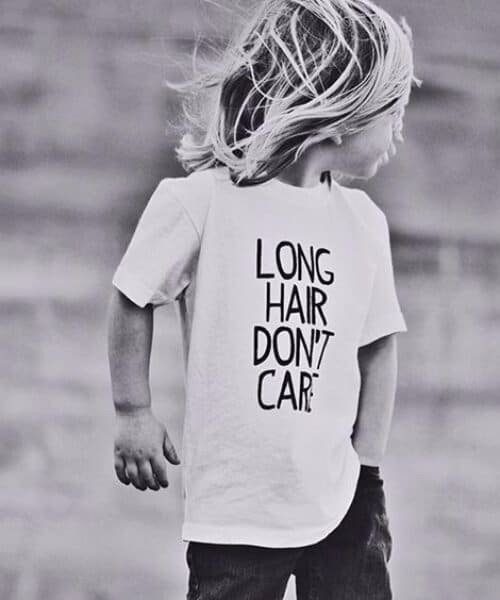 A young age is perfect to try long haircuts for boys. It’s good to experiment and see how they look and feel with longer hair. It is also a good idea to first grow out their hair instead of chopping it all off for health reasons. If you want to go modern, then this is clearly the cut to choose. 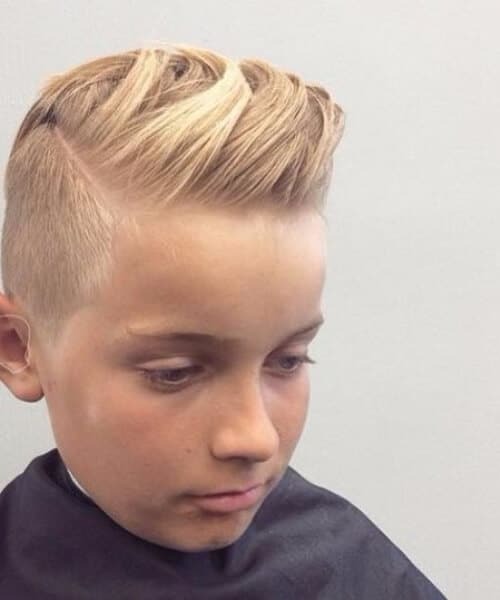 It’s a short boys haircut with a hard part and faded sides into which a model has been designed. The model itself draws inspiration from footballer Cristiano Ronaldo. 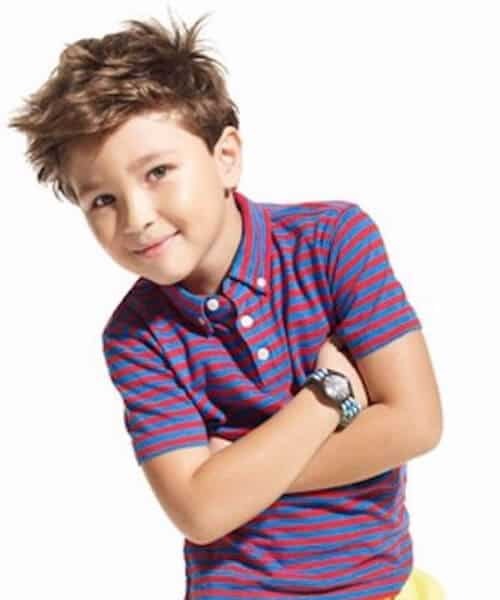 You can also use the hard part in case your little boy has curly hair, and you want to cut his hair short, but you don’t really want it to be boring. All you need to do is use the hard part, shave it on one side and let the curls unfold on the other. Here’s another example of what you can do with a hard part. If you’re on holiday, for instance, your little one will surely want to play. The hard part will help you here as well. Tie the longer strands in a bun, following the part. 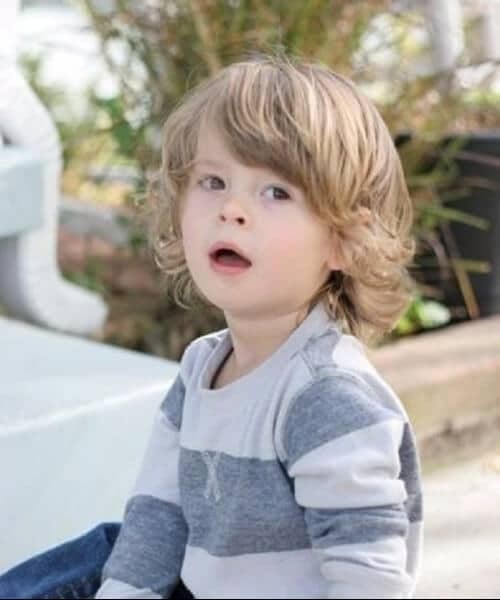 Here’s a shaggy long haircut every mom will fall in love with. It will make it impossible to keep your fingers out of it. 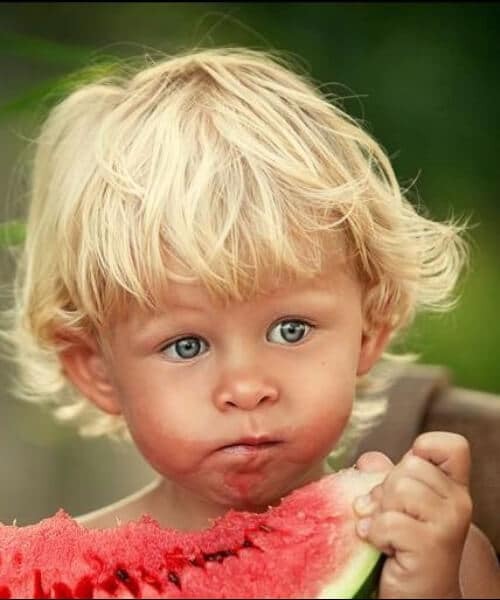 You’ll basically want to give your son a good ruffle every time he passes you by. And why not? This is yet another type of shaggy but just as charming. It’s for smaller children, toddlers even, who haven’t yet lost their baby curls. If you can’t seem to make up your mind to cut them off yet, go for this style instead. 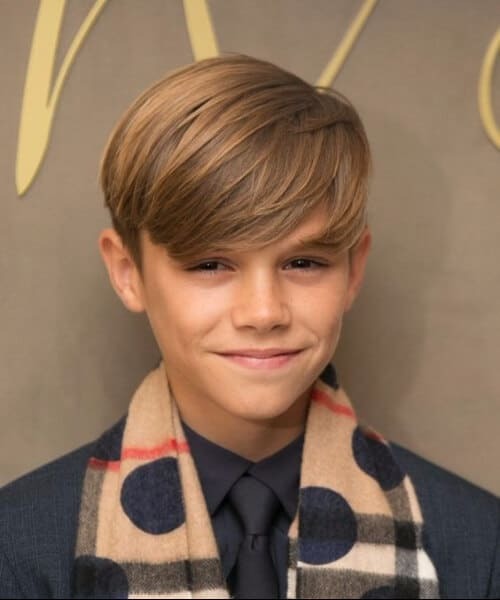 Two of the Beckham boys feature on this list, among other celebrity kids, and this is just the first one. 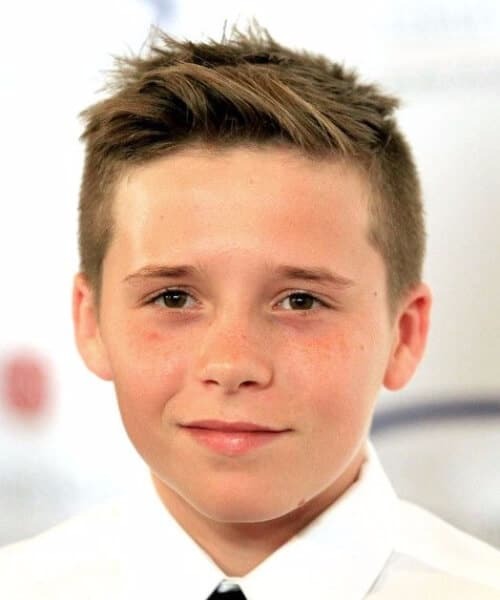 Brooklyn Beckham is famous in his own right now, thanks to his chiseled good looks, charm, style, and, yes, fine hair. Here is a haircut for teenage boys that will require a bit of grooming and preparation every time they leave the house. Therefore, you might want to prepare yourself for that. 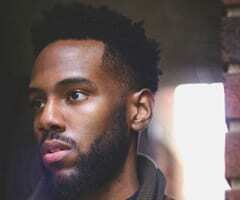 You might also want to invest in some good hair care products for him. There’s possibly nothing more beautiful in a young boy than a layered haircut. 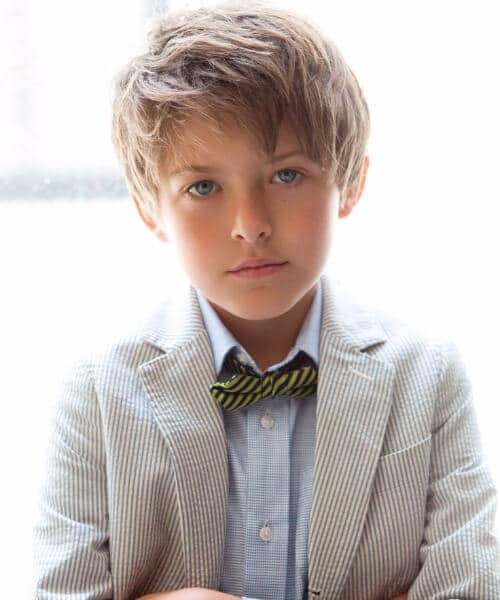 If your pre-teen agrees and has the style to match this type of cut, you should definitely go for it. He’s going to be big with the girls. Here’s a fun one for you and your kid. This one is for the small boys, of course, who still wear Superman pajamas and want to defeat Batman in one on one combat. 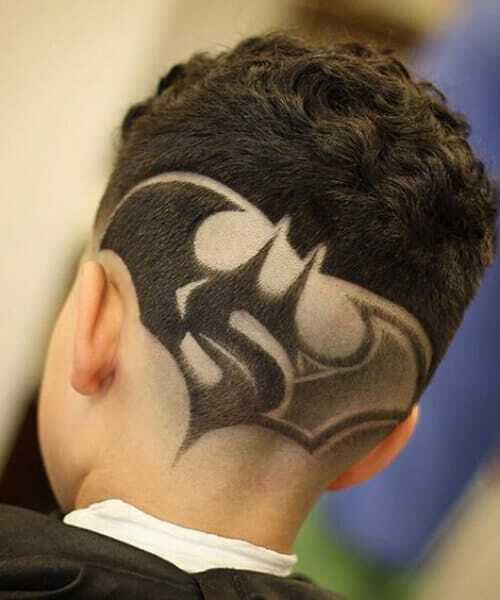 It’s a short haircut with a faded back and a fantastic Superman-Batman logo design. 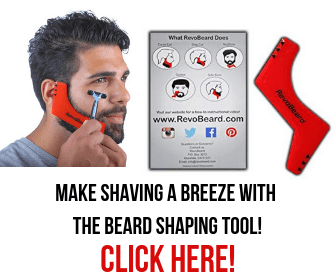 We’ve had the fauxhawk, now it’s time we took a look at the real thing. While we agree it’s a tad difficult to pull this look off as an adult, there is no better time to do it than as a kid. Think about it – no boss, no office, no meetings, no banks. It’s perfect! This curly sun-kissed look is inspired by the lads down under. It’s a type of a perpetually-on-vacation surfer look, which is exactly what your kid kind of is, right? In fact, it’s a medium sized messy curly cut. Let’s stay in the realm of curls for a moment longer with this smashing example of a shorter variation of the curled look. 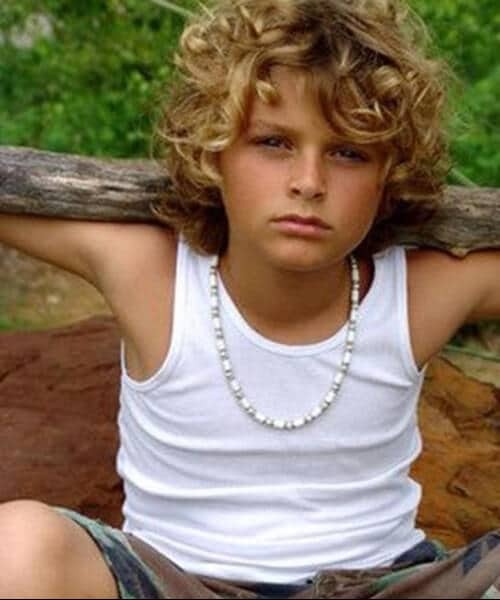 This dashing gentleman has more ringlets than he has curls, cut shorter and in a rounder shape. Oh, and we absolutely adore the color! 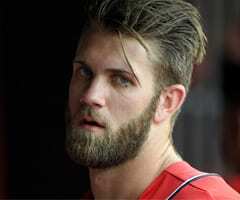 This is a very trendy windswept combover boys haircut that will definitely inspire you for the summer season. While it might be a tad early for your little one to be sporting a Princeton jacket, you can bet this is what he’ll look like in 15 years, when he does. Here’s a toddler with a shaved side and an oversized one-sided set of bangs. All in sandy blonde. What could you possibly want more when it comes to having the coolest baby on the playground? Nothing, we suppose. You did your job, parents. We could not have possibly made this list without including a blast from the past such as a short haircut with 90s spikes. Remember when all the boys were absolutely obsessed with putting their hair up in spikes using insane amounts of hair gel? We don’t actually know if your kid will be willing to do it, but it will be a fun family experience to try. Speaking of blasts from the past, if you are on the more traditional side or are not so keen on the modern takes on haircuts, you can always keep to the classics. They have lasted so long for a reason, after all. Here is a very simple cut, that is guaranteed to make your little boy as happy as pie. 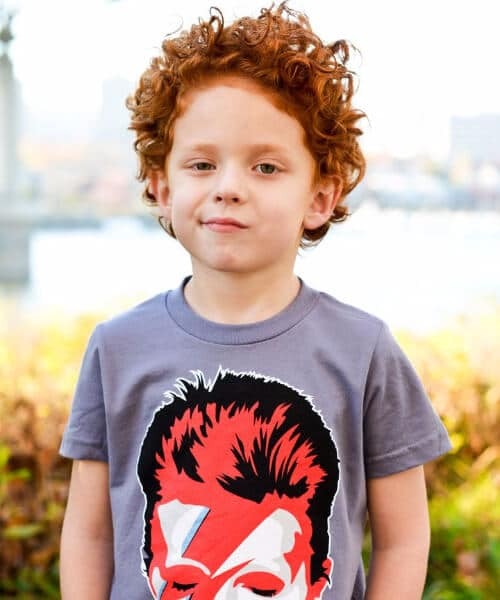 If your superstar of a kid happens to have a lovely head of thick hair or an outstanding natural hair color, then there’s no reason to cut it. 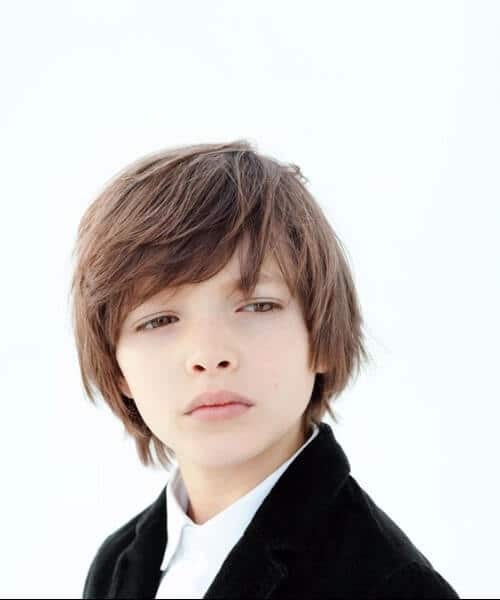 Let it grow longer in the front and style it in a shaggy mane that can flaunt his best assets. There are pompadours and then there are beautiful pompadours. This haircut falls in the latter category. 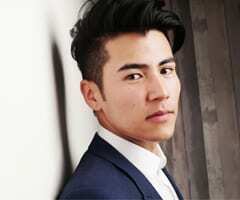 The perfectly combed strands of hair will stay in place all day with the help of some hair wax or a little hairspray. Remember the good old days when parents used to put a bowl over their kids’ heads and then cut around that? Neither do we. Because nowadays we have the amazing and one of a kind haircuts for them that can really stop traffic. Remember that moment in Roald Dahl’s autobiography when, as a child, he put a mouse in one of the candy jars in the sweet shop to prank the mean woman who ran it? This kid looks like he’s about to do the same thing. Boys will be boys. Make sure to give them the haircut to match. Here’s a little dandy fellow for you. He’s sporting a super cute and fluffy honey blonde high top haircut. It has been combed to one side for him, and it also looks a little windswept, which makes it even more charming. 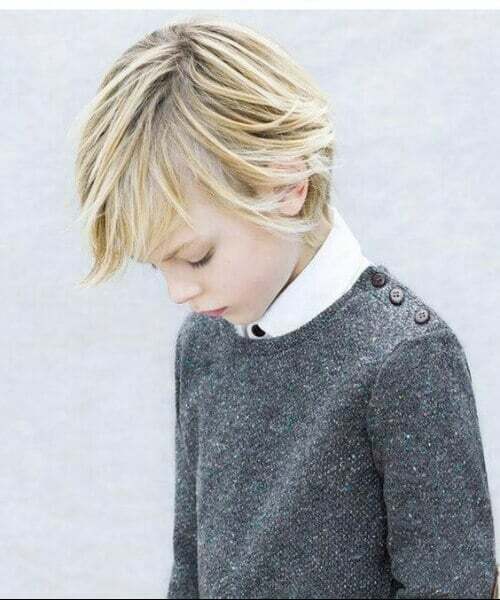 If your little boy is showing signs of a major rocker star, then this is definitely the haircut for him. It has a unique flowing quality to it that will allow him to head bang away while he is listening to his favorite band. 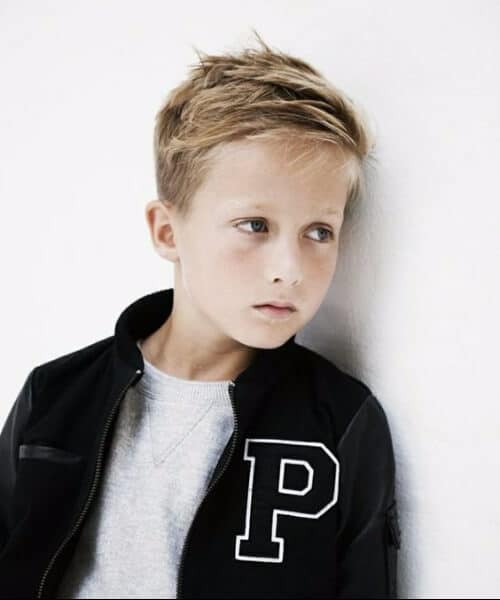 As announced above, here is the second of the Beckham boys who made it onto our list. His good looks are undeniable, as he also made it into one of Burberry’s campaigns. Just look at that dark honey blonde hair! One of the most modern trends dictates that a good, long fringe goes perfectly well with a nice undercut. This is especially useful in the summertime when that pesky heat might affect your little one. Try it out and see how it goes. 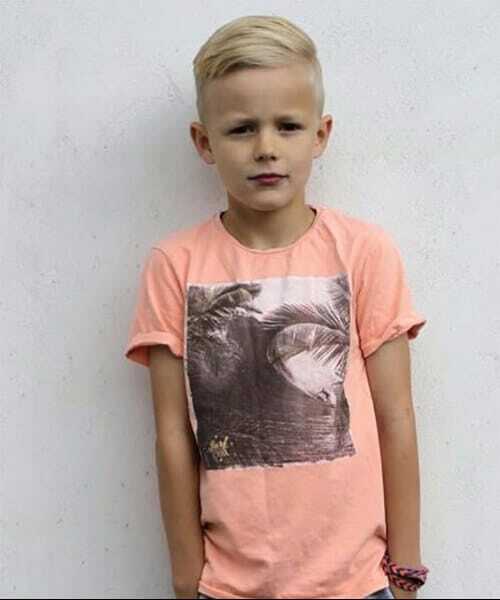 Here is a very relaxed and beautiful haircut which your little man can wear during the summer holiday. It’s a bit choppy, with uneven bangs and a messy top that allows the strands to fly in the wind out of their own accord. Just what he needs when he’s playing on the beach. 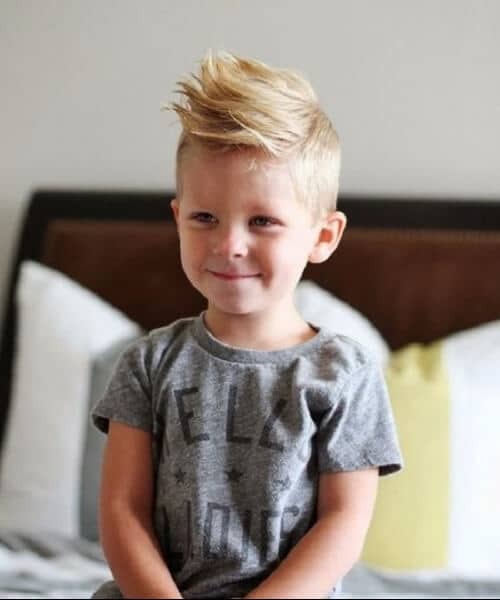 One of the sweetest ideas you could go for hair wise for your little boy would be the mop top. The bangs are just long enough not to disturb his vision and you don’t have to get rid of his baby curls just yet. Dress him up all you want, a pre-teen boy will always be a bit scruffy. It’s part of the job description, probably. Therefore, you might as well enjoy it with a beautiful haircut that will highlight his scruffiness as something wondrous to behold rather than to polish away. 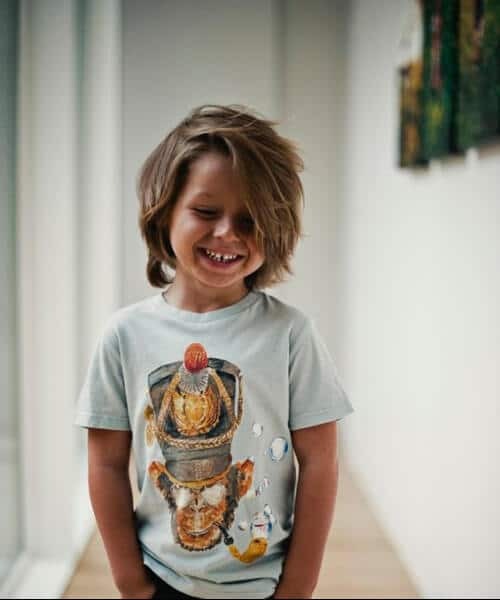 Who says toddlers can’t be just as fashionable as their older brothers or even as their dads? 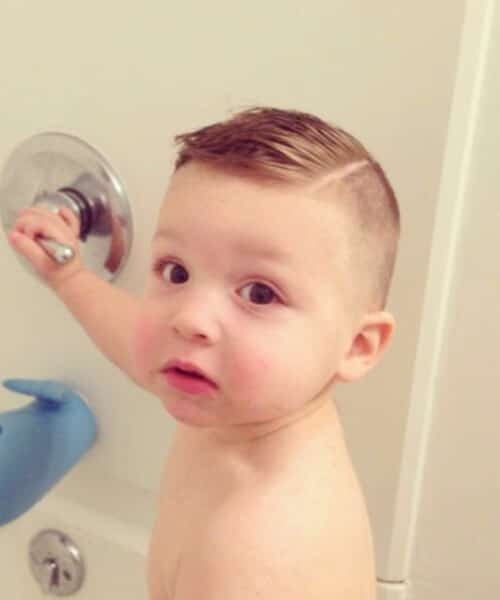 Here is a complete cutie pie after his bath with a hard part comb over on one side with a high fade and the beginning of his first pompadour. Daddy is so proud! Now let’s talk a bit about some famous boys around the world. 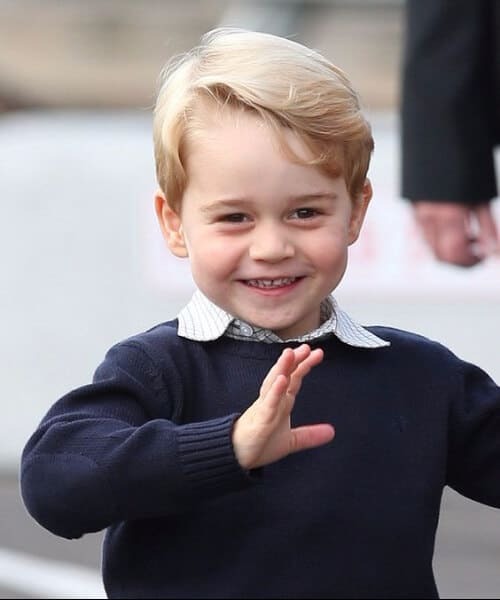 Here’s the future (future, future, actually) king of England, Prince George. 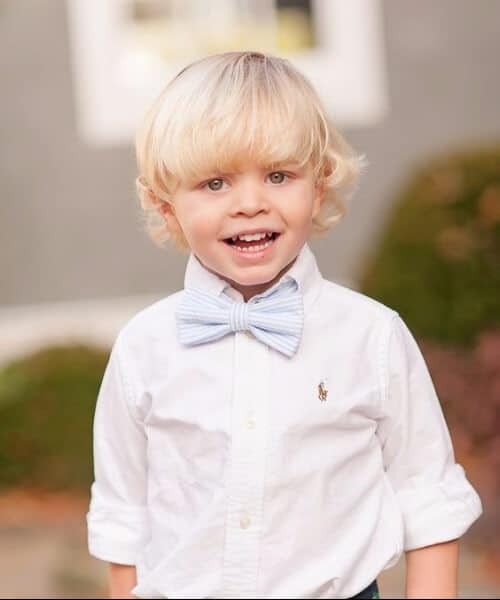 He’s downright adorable with his sunny blonde hair, oh, so classical English side-part and forehead curls, and that mischievous grin! What is he up to in that palace?!? 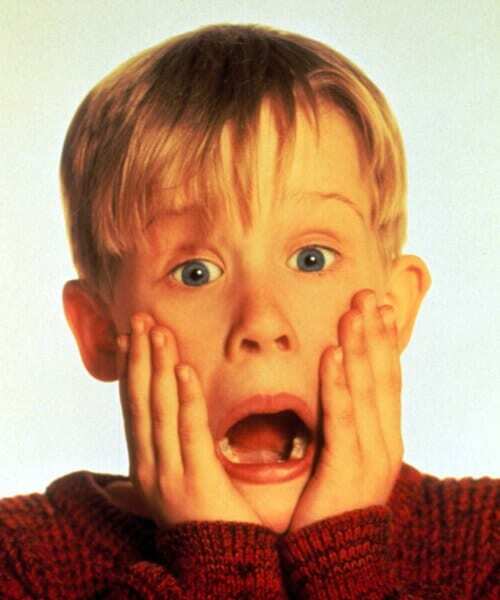 When the movie came out back in the 90s, there probably wasn’t a boy around who didn’t want a haircut like Kevin’s. He was America’s smartest, coolest, and, let’s face it, the kid with the coldest blood we’ve ever seen. 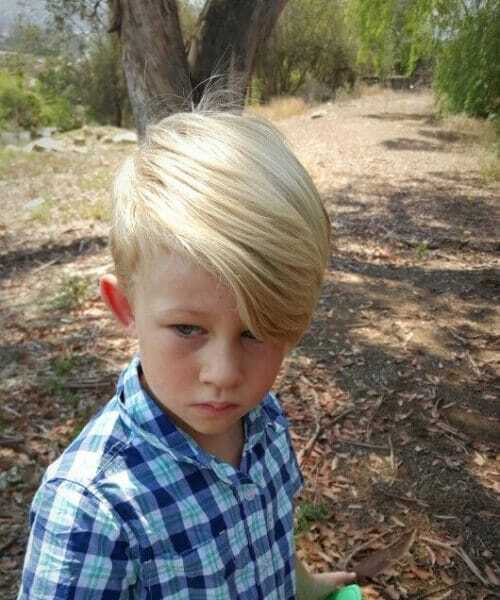 His haircut consists of a signature blonde hair, very sleek and shiny combed all over. Oh, and those 90s bangs, of course! Yikes!! When speaking of famous boys haircuts, it would be quite impossible not to mention one of the – if not the most – famous boy in the world. The Boy Who Lived. The Chosen One. Harry Potter. He is described in the books as having messy jet black hair that stuck right up at the back no matter what he did to it. It was cut medium short. 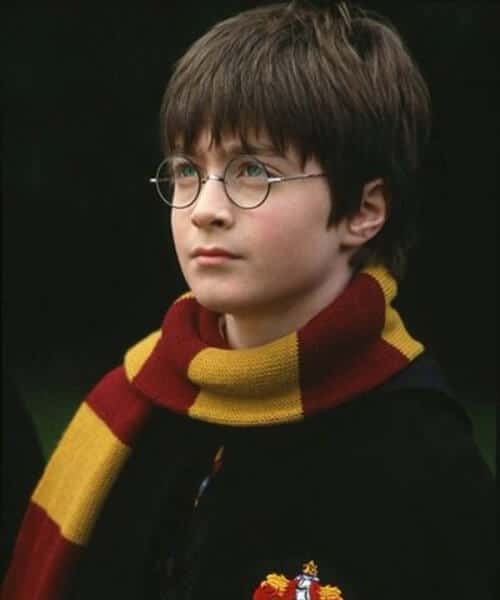 In the movies, he was portrayed in that sense by actor Daniel Radcliffe. It is really pointless now to try and explain how many times this haircut has been copied. Join the trend, won’t you? It seemed only fair, since we’re talking about famous boys haircuts and discussed Harry Potter at large, to take on his best friend as well, Mr. Ron Weasley. He also served as a massive source of hair inspiration for kids around the world. He has a mass of flaming red hair and his cut is undescriptive. 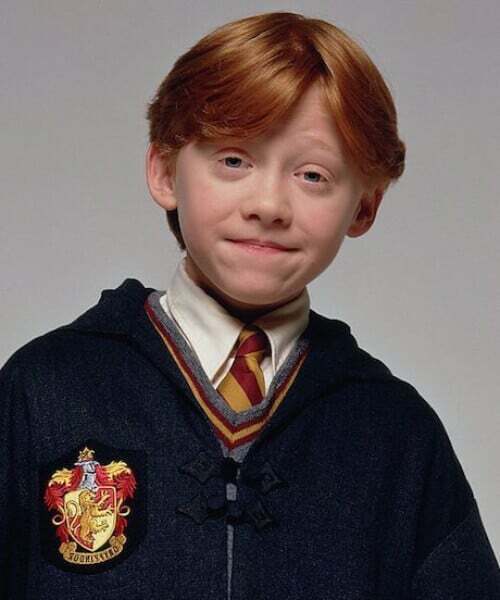 We are safe to assume it’s medium and messy, though knowing Ron, his mother probably cut his hair for him. Adorable nonetheless. Another famous boy who took the world by storm was none other than Canadian-born Justin Bieber. His hair influenced millions around the world. 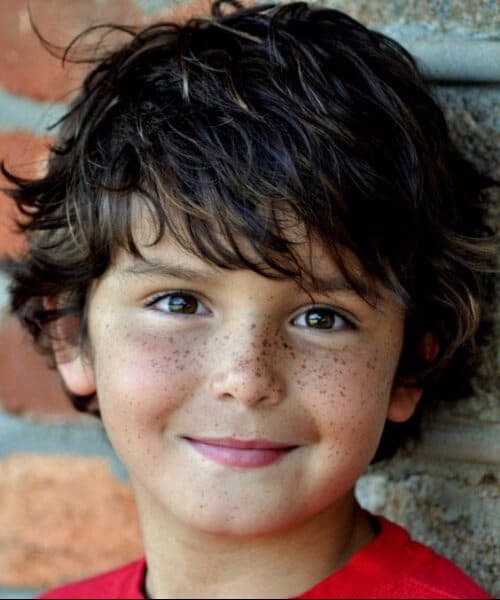 Although he has had tens of different cuts over the years, we have chosen this simple boyish style in deep chestnut brown as inspiration for your teenager son. 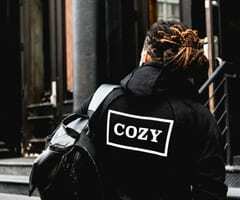 No, we’re not talking about the Japanese fashion house. We’re merely stating a fashion trend for very trendy boys who are not afraid to embrace their dapper side. And make sure to reflect that not only in their clothes but in their haircuts as well. There’s that short period when you try to pin a bow tie to their little shirt and it’s as big as their head. That’s when you can’t get enough of them and that’s also when their little bangs and soft curls are probably the most beautiful thing you’ve ever seen in your life. 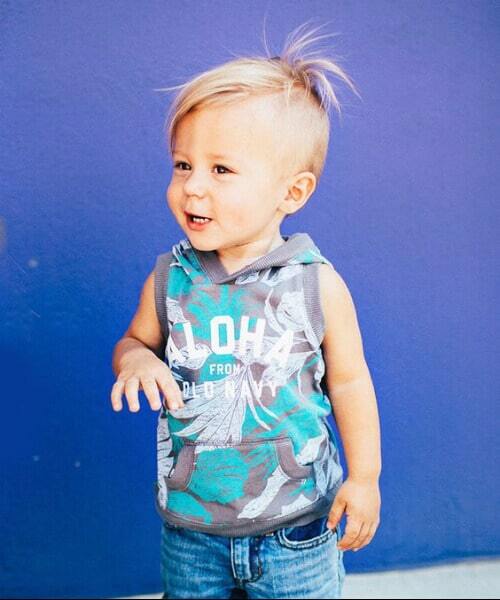 Is there any way a toddler can be any cuter than he already is? Yes, with the proper haircut. You can do it yourself at home or you can opt for a very good barber or even stylist. In this way, your little one gets all the attention he deserves. Another option which you can take is simply letting their hair grow out as much as you or they want. 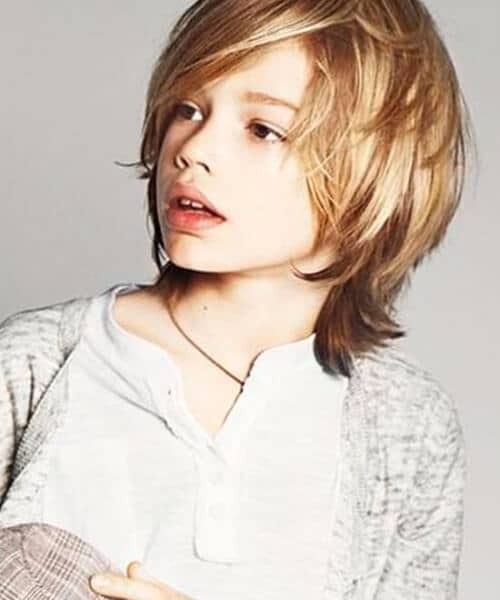 What do you think about this long hair for boys idea? 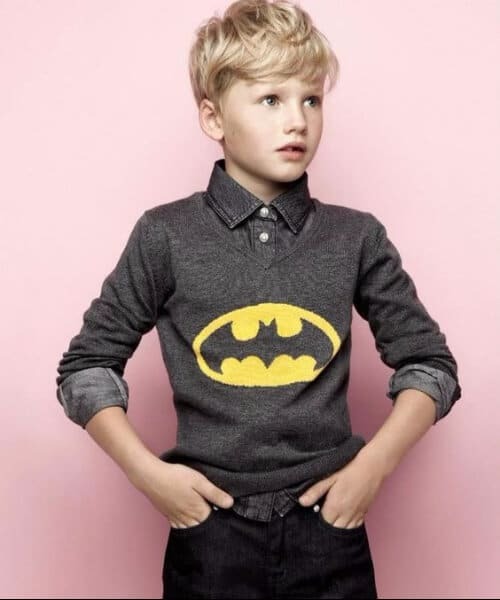 What kind of haircuts have you been giving your little superhero so far? 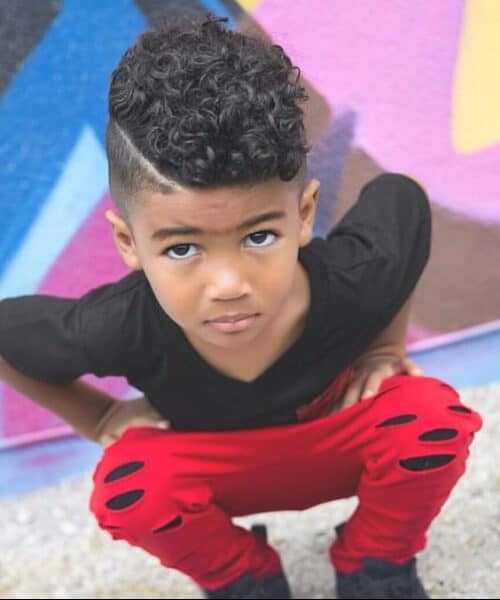 If you have any tips and tricks, as well as ideas, please share your comments on boys haircut versions below as we would love to hear from you.